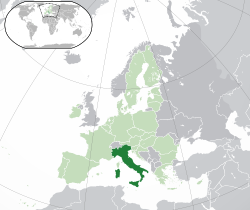 Italy is a country in Southern Europe and a member of the European Union. Its official name is Repubblica Italiana. Italy is a democratic republic and is a founding member of the European Union. Italy is also a member of the G8, as it has the 8th largest Gross Domestic Product in the world. Its President is Giorgio Napolitano and its Prime Minister is Matteo Renzi. Before 1861, it was made up of smaller kingdoms and city-states. Italy is a peninsula, meaning it is surrounded by the sea on all of its sides apart from one side of the country (its north side). Northern Italy is separated from France, Switzerland, and Austria by the Alps, a chain of mountains. Mont Blanc (Monte Bianco in Italian or white mountain in English), the highest mountain in western Europe, belongs to this chain. The second important chain of mountains in Italy is the Apennines (Appennini in Italian), which are in central and southern Italy. The capital of Italy is Rome. Other cities in Italy are Milan, Turin, Florence, Naples, and Venice. The country has a number of islands, the biggest of which are Sicily and Sardinia, which can be reached by ship or aircraft. Northern Italy has some of the biggest lakes in the country, such as Lake Garda, Lake Como, Lake Maggiore and Lake Iseo. Because it is surrounded by the sea, Italy has many kilometers of coast, which brings tourists from all over the world. Tourists also come to see Italy's many historical places. Two very small countries are located within Italy. They are San Marino, which is surrounded by part of Northern Italy, and the Vatican City, which is inside Rome. People from Italy are called Italians. Nearly all the Italians are Christian, and most of these are Roman Catholics. The population of Italy is a little over 60 million. About 2.7 million of them live in Rome, and 1.3 million in Milan. The people of Italy are partly descendant from the ancient Romans. 550,000 are Pentecostals and Evangelicals (0.8%). 235,685 Jehovah's Witnesses (0.4%), 30,000 Waldensians, 25,000 Seventh-day Adventists, 22,000 Mormons, 20,000 Baptists, 7,000 Lutherans, 4,000 Methodists. The country's oldest religious minority is the Jewish community. It has roughly 45,000 people. It is no longer the largest non-Christian group. About 825,000 Muslims live in Italy. Most of them immigrated. (1.4% of the total population) Only 50,000 are Italian citizens. In addition, there are 50,000 Buddhists 70,000 Sikh and 70,000 Hindus in Italy. The Head of State is Giorgio Napolitano, whose task began in May 2006 and, for the first time since Italy became a republic, started a second term in May 2013 (the President of the Republic remains for 7 years). Napolitano is the eleventh President of the Italian Republic and he was preceded by Carlo Azeglio Ciampi. The first president was Enrico De Nicola. The Head of Government is Matteo Renzi, who became Prime Minister on February 22, 2014, succeeding Enrico Letta. Renzi is also the Mayor of Florence and Italy's youngest-ever Prime Minister, at age 39 when taking office. Italy was one of the first members of the European Union and in 2002, along with 11 other European countries, it changed to using the euro as its official currency. Before this, the Italian lira had been used since 1861. The Colosseum in Rome is very old. Before 1861, Italy was not a state. The area was made of a group of independent states, ruled by other countries (such as Austria, France, and Spain). In the 1850s the Earl of Cavour was the Head of Government of the "State of Sardinia". He talked to the Austrians in Lombardy and Veneto and said they should create a Northern Italian state. This happened, but other Central and Southern Italian states also joined Piedmont to create a bigger state. In 1922, a new Italian government started, and it was ruled by Benito Mussolini, the leader of Fascism in Italy. He became Head of Government and dictator, calling himself "duce" - which means "leader" in Italian. He became friends with German dictator Hitler, and Mussolini followed him into World War II. Italy entered the war in 1940 as an ally of Germany and Japan against France, Great Britain, and Russia. During the war, Italy controlled most of the Mediterranean Sea. ↑ "Ethnologue report". Ethnologue.com. http://www.ethnologue.com/show_country.asp?name=IT. Retrieved 30 October 2010. ↑ "Monthly demographic balance: January 2011" (in Italian). Istat. 10 September 2011. http://demo.istat.it/bilmens2011gen/index.html. Retrieved 10 September 2011. ↑ 3.0 3.1 3.2 3.3 "Italy". International Monetary Fund. http://www.imf.org/external/pubs/ft/weo/2011/02/weodata/weorept.aspx?sy=2009&ey=2016&scsm=1&ssd=1&sort=country&ds=.&br=1&c=136&s=NGDPD%2CNGDPDPC%2CPPPGDP%2CPPPPC%2CLP&grp=0&a=&pr1.x=27&pr1.y=19. Retrieved 14 October 2011. ↑ "Distribution of family income – Gini index". CIA – The World Factbook. https://www.cia.gov/library/publications/the-world-factbook/fields/2172.html. Retrieved 9 July 2010. ↑ "Comune di Campione d'Italia". Comune.campione-d-italia.co.it. 14 July 2010. http://www.comune.campione-d-italia.co.it/. Retrieved 30 October 2010. ↑ "European Countries". European Union. http://europa.eu/abc/european_countries/eu_members/italy/index_en.htm. Retrieved 2009-07-24. ↑ "Alps are the border between Italy and other countries". http://www.blurtit.com/q714533.html. ↑ "Four missing in Alps avalanche". BBC News. 20 April 2002. http://news.bbc.co.uk/2/hi/europe/1940971.stm. Retrieved 23 July 2009. ↑ "Biggest Islands in the World". http://www.worldislandinfo.com/LARGESTV1.html. ↑ 11.0 11.1 11.2 "Italy: Encarta". MSN. http://encarta.msn.com/encyclopedia_761555207/italy.html. Retrieved 2009-07-24. ↑ Zwingle, Eria. "National Geographic". National Geographic. http://ngm.nationalgeographic.com/ngm/0205/feature6/index.html. Retrieved 2009-07-20. ↑ Watson, Philip (19 March 2005). "The lake show". The Guardian. http://www.guardian.co.uk/travel/2005/mar/19/italy.guardiansaturdaytravelsection. Retrieved 23 July 2009. ↑ "Tourism damaging Med's wetlands". BBC News. 15 July 2004. http://news.bbc.co.uk/2/hi/science/nature/3896487.stm. Retrieved 23 July 2009. ↑ "Alarm sounded over Italy's treasures". BBC News. 20 November 2002. http://news.bbc.co.uk/2/hi/europe/2496923.stm. Retrieved 23 July 2009. ↑ "Italy". Central Intelligence Agency. https://www.cia.gov/library/publications/the-world-factbook/geos/it.html. Retrieved 2009-07-25. ↑ "Flag Counter: Italy". http://flagcounter.com/factbook/it. Retrieved 2009-07-11. ↑ "List of UNESCO World Heritage Sites". UNESCO. http://whc.unesco.org/en/list/. Retrieved 2009-07-24. ↑ "Countries by wine Production". http://www.reference.com/browse/wiki/Wine_production_by_country. ↑ (Italian) "Italy: 88% of Italians declare themselves Catholic". Corriere della Sera. 2006-01-18. http://www.corriere.it/Primo_Piano/Cronache/2006/01_Gennaio/17/cattolici.shtml. Retrieved 2009-05-10. This page was last changed on 11 December 2014, at 04:58.